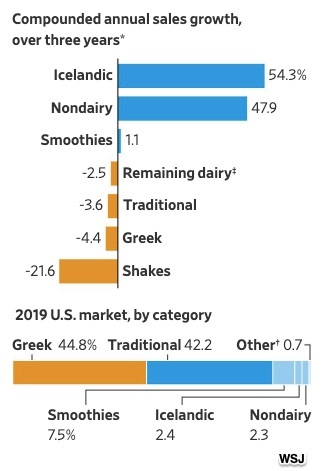 We could say that the wholesome trend in food was led by yogurt. FAGE was the first Greek yogurt sold in the U.S. Then there was Chobani, Danone, and General Mills. Now startups have added to the yogurt lineup. Made from plants, their options give us a whole new chapter of choices. We can select Tempt Original Hemp Yogurt or Forager Creamy Dairy-free Cashewgurt. There is almond yogurt and soy yogurt. And during January, Chobani launched nine coconut-based yogurts. According to WSJ, there are a whopping 306 yogurt varieties at a typical supermarket. But here we have a paradox. There is so much more to buy. So, returning to where we began, the yogurt section of the supermarket can indeed attract us. Then though, we see how many decisions we have to make. Like buying a car, we wish we had a default deal rather than debating each option. My sources and more: This WSJ article reminded me that we haven’t looked at choice fatigue in awhile. Slate summarizes some of the past research that got a second look in this Stanford paper. And thanks to Fortune for more yogurt facts, Mental Floss for Fage info, and foodrepublic for differentiating between Greek yogurt and skyr. Our featured image is from foodrepublic.com. Our choice fatigue discussion was previously published in a past econlife.